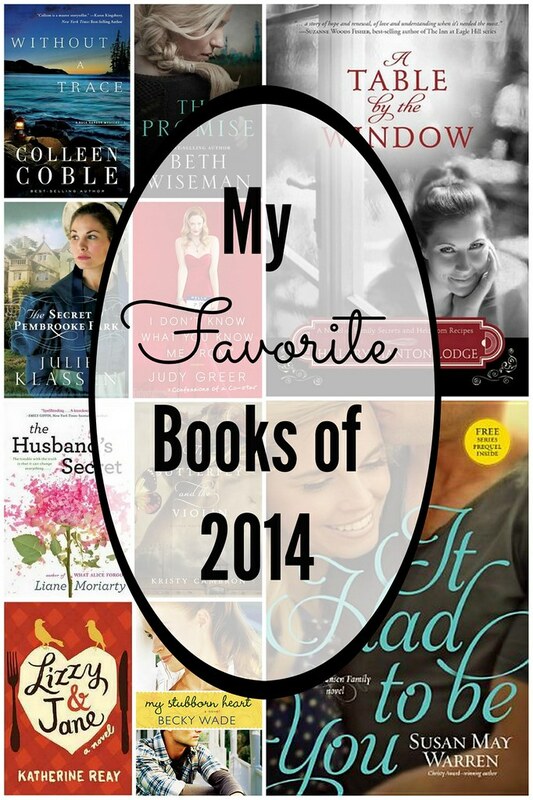 Last year I made the goal to read 50 books during 2014. I was *this close* to finishing (48! ), so for 2015, I’m determined to read all 50, if not more. You can keep up with my progress and what I’m reading on Goodreads. I just finished Liane Moriarty's Big Little Lies, and I have the feeling it’ll be on my favorite list next year. Without a Trace by Colleen Coble: Suspenseful, a little mystery, a little romance—my kind of book (and it’s only book one in the series). The Promise by Beth Wiseman: Inspired by true events, this gripping book is truly an international eye-opener that’s very relevant to today’s current events. A Table By the Window by Hillary Manton Lodge: I’ve come to love “foodie fiction” throughout the past two years, and after reading an interview with the author, I knew this one had to make its way onto my Kindle. Book two in the series can’t get here soon enough. The Secret of Pembrook Park by Julie Klassen: This is my favorite Julie Klassen book to date. If you’re a fan of gothic literature and Charlotte Brontë, you won’t want to miss this. I Don’t Know What You Know Me From by Judy Greer: I’ve loved Judy in everything I’ve seen her in, and her candid, funny stories of Hollywood, love, Jennifer Lopez, and life in general will have you laughing out loud. The Husband’s Secret by Liane Moriarty: After hearing so much buzz about this book online, I finally borrowed a copy from the library. I couldn’t put it down, and you won’t want to miss the twist at the end. The Butterfly and the Violin by Kristy Cambron: This was such a different take on the WWII era. Cambron’s love of fiction and art meet beautifully in her debut novel. Lizzy and Jane by Katherine Reay: Katherine’s debut novel was probably my favorite book of 2013, and this one did not disappoint. If you love Jane Austen but are looking for an entirely different spin on her influence, this is one book you need to pick up. My Stubborn Heart by Becky Wade: I’ve read Becky’s other books and loved them, so this one had been on my must-read list for awhile. It was by far my favorite one, and the chemistry between the characters is incredible. It Had to Be You by Susan May Warren: I’ve fallen in love with the Christiansen family, and luckily for me, the whole series is based around them. Book two so far has been my favorite, but they’re all worth a read.